Other Information: Carrier of many diseases; adults can live one to two months without feeding. 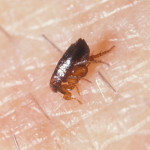 Fleas can carry a number of diseases and the females lay up to 800 eggs in a lifetime. Appearance: Appearance differs by species, but all adults are very small, roundish, with eight legs (larvae or seed ticks have six legs); 1/8 to 1/2 inch long. Reproduction: Mating usually occurs while adult ticks are on the host animal; female hard ticks feed only once, and lay one large batch of up to 10,000 eggs; female soft tick will feed several times and lay 20 -50 eggs after each meal; eggs hatch in 19 to 60 days.